We are constantly reviewing and researching the newest techniques, materials and methods available in the construction industry, and are particularly focused on finding and integrating environmentally sustainable technologies and practices into our designs. We are certified Green Building Professionals and can provide LEED and GreenPoint Rated testing and design services as needed for your project. 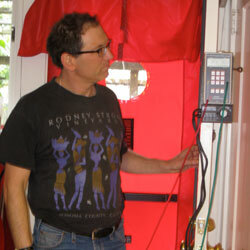 We have also developed partnerships with other home performance professionals to provide home performance testing for you. Services include testing and recommendations for energy and building envelope, water efficiency, indoor air quality, waste reduction, carbon footprint, and safety & emergency preparedness.